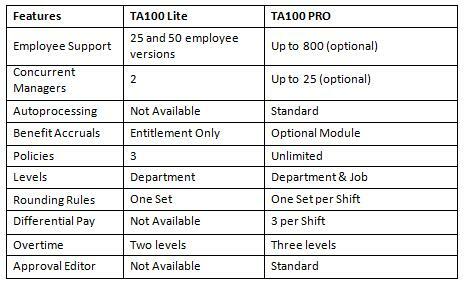 The all-new TA100 LITE offers PRO power at a LITE price. This state-of-the-art entry level time and attendance tracking system package is designed for companies with fewer than 50 employees, yet has many of the features found in Time America's TA100 Pro. The set-up wizard makes implementation so simple you can have it up and running in no time! Supports an unlimited number of data collection terminals, including all TA700 series, Biometric Fingerprint, and Hand Punch time clock terminals.